Your spells cost (1) less. Apprentices are great for bossing around. "Conjure me some mana buns! And a coffee! Make that a mana coffee!" everytime she say "Me... ?" , i rethink my planned moves.. 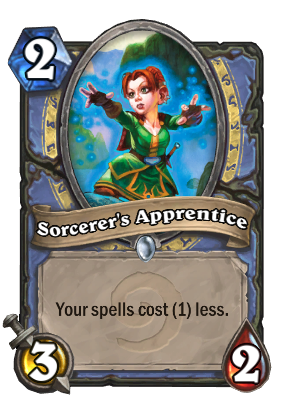 Even with a Freeze Mage it would probably be rare, but imagine dropping two of these with 2 Frostbolt and 2 Ice Lance. Maybe a Fireball or two if they run with some. That's a 20-26 damage turn for 6-8 mana, but very unlikely outcome. Does this effect stack with two apprentices on the field? From the description, shouldn't this card have the possibility of making spells cost -ive mana? After all "(1) less than" 0 = -1. Why not make anything negative? That isn't the point though. It says it costs less. If it is at 0 then it doesn't cost anything so it can't cost less. No need to be snarky with peoples questions brah. "Less" is the operating word here. -12 is "something", and less of something always moves towards 0. The only integer you cannot have less of.